Sergey Naryshkin has confirmed that Russia was leaving the PACE until the end of 2015 and added that next year the country might cease its membership in the Council of Europe. The comments came after the Russian delegation decided to stop its activities in PACE till the end of the year because of the assembly’s decision to strip Russia of voting rights. 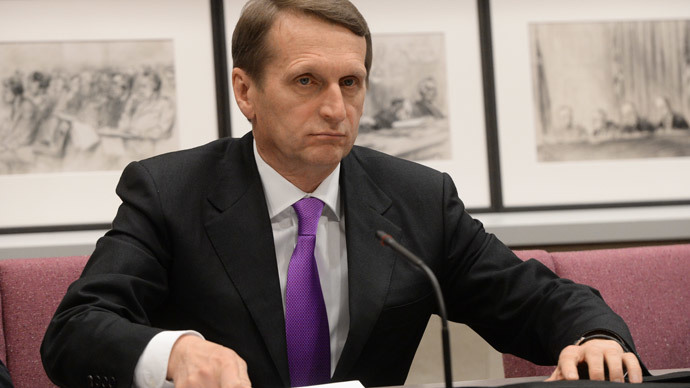 Earlier this week Naryshkin described the limitation of Russia’s powers in the PACE as unlawful. The head of the Russian mission, Aleksey Pushkov, has also said that the exit from the CE was possible as he talked to reporters in Strasbourg. “We are leaving the Parliamentary Assembly till the end of the year and we congratulate the assembly with passing this decision that I personally hold as unacceptable and that delivers a very serious blow on the dialogue between parliaments in Europe,” Pushkov said. “It practically removes PACE from the main route of this dialogue as in the absence of the Russian delegation the debates in this organization will become just an empty exercise. We will remain in the Council of Europe till the end of 2015 as our fees in this organization have already been paid. We remain members of the CE’s committee of ministers, which means that the cooperation will remain on the government level,” he added. According to RIA Novosti, the general budget of the Council of Europe amounted to about €403 million and Russia’s payments reached €32 million in 2014. Last year Pushkov told reporters that with its rights in PACE restricted Russia could reduce the fee it paid to this organization. However, the official acknowledged that this plan was difficult to implement as all payments to the CE and PACE were made as a single transfer. The conflict between Russia and PACE developed in 2013 and 2014 as Russia opposed the coup d’état in Ukraine that brought the current Kiev regime to power. In April last year, the European body approved an anti-Russian resolution, depriving Moscow’s delegation of the right to vote and banning it from participation in ruling bodies and monitoring missions till the end of the year. Several MPs have already proposed that Russia exit the Council of Europe and its Parliamentary Assembly because of unfriendly attitude of these organizations. Most recently, two Communist Party lawmakers addressed senior parliament leaders with a request to recall Russia’s delegation from PACE as the membership in this organization has only a “negative influence” on the country.